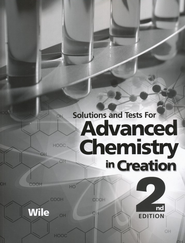 The softcover Solutions and Tests Manual accompanies Apologia's Advanced Chemistry in Creation Student Book, 2nd Edition and contains answers to solutions to the extra practice problems, module tests, quarterly tests, and solutions to all the tests. A booklet containing an extra set of module tests is shrink-wrapped with the manual. Student Text sold separately (Item #5364) From Apologia.